I had a very specific idea in mind when I started planning for this coat. I wanted to make Miss Seven a nice Winter coat that she could wear out for special occasions. She’s old enough now to have a few special items in her wardrobe and I’m hoping this will also help educate her on how to appreciate, respect, and treat special garments. 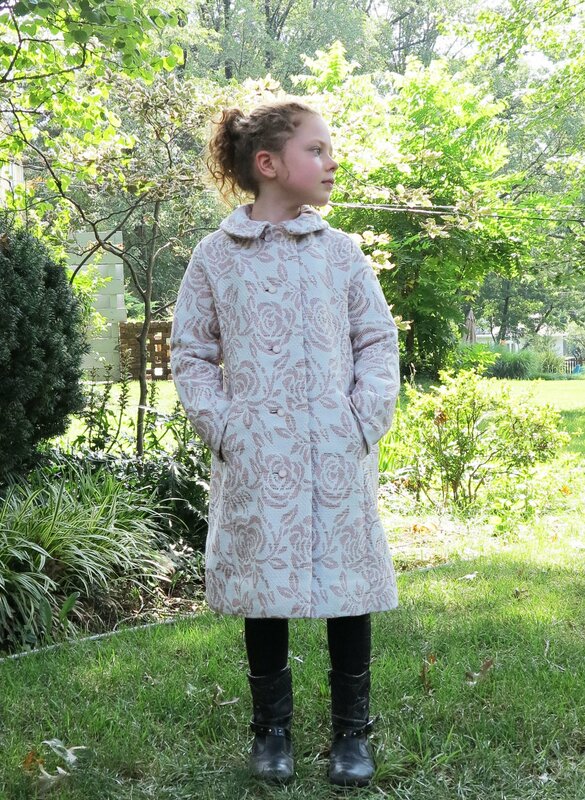 The outer fabric of the coat is a woven wool blend. It is extremely beautiful in real life. It has a nice, coat-worthy weight, with little threads of gold and tan woven through it. 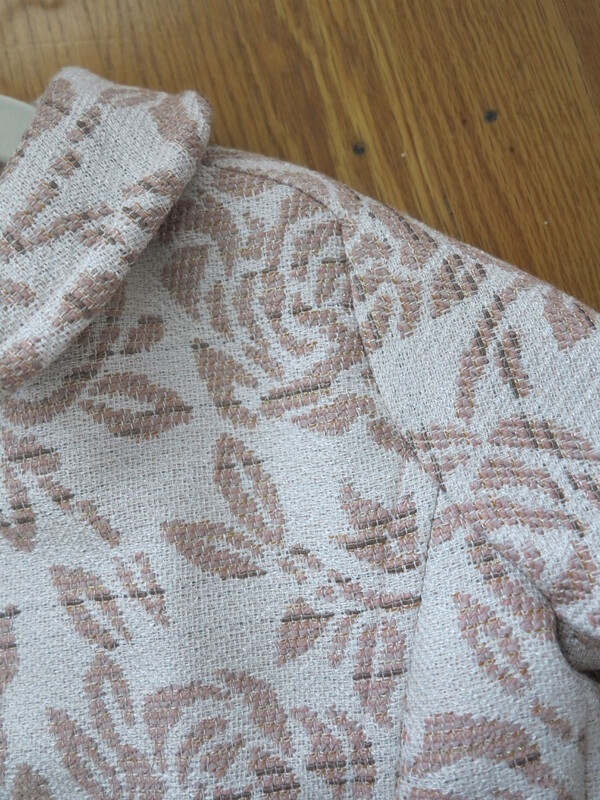 Both sides of the fabric are useable, with the rose and background colours simply reversed on the underside. 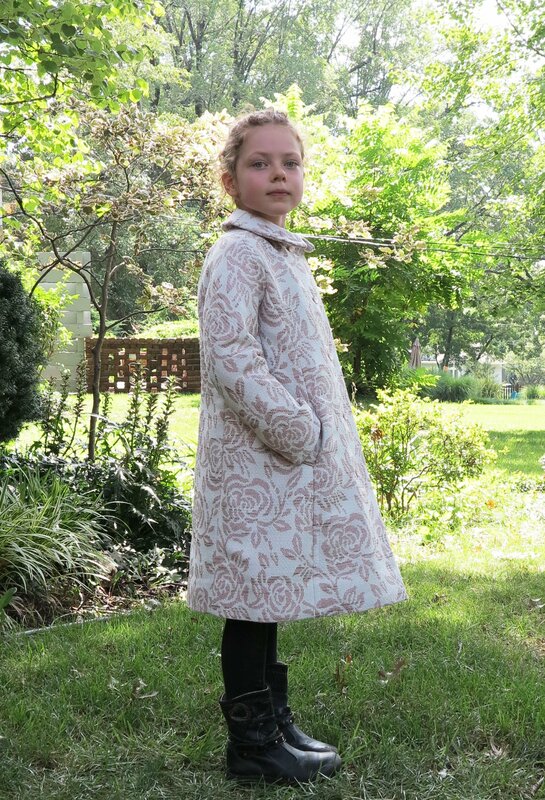 I thought about incorporating both sides of the fabric into this coat. I also though about keeping this coating fabric entirely for myself. It’s probably not the best choice of fabric for a child. The weave is not exceptionally tight, but it is still quite stable. I suspect it may get a few snags during it’s lifetime, but the slightly motley mix of threads through the weave is forgiving enough to disguise any repairs that may be required. The fabric frayed horribly while I was working with it. There was a lot of hand-stitching and basting involved in the tailoring of this coat, which made the unravelling quite an issue. I used a LOT of Fray Check. I ended up painting it around the edges of every pattern piece. It was also essential in making the bound buttonholes. 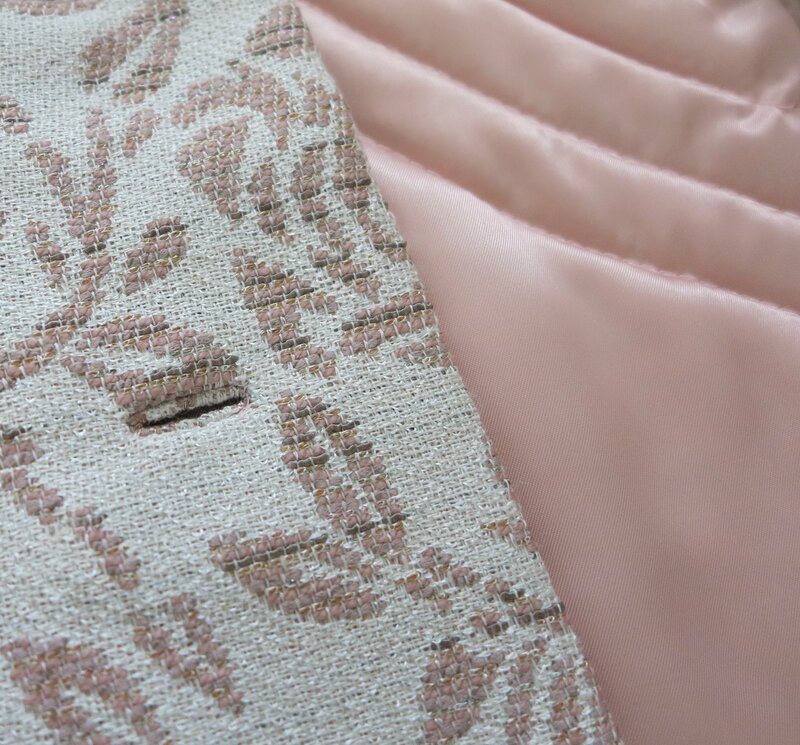 In retrospect, I think bound buttonholes were not the best choice for this fabric because of the loose weave. Hand-worked buttonholes (a la Claire Schaeffer’s French jackets) would have been the sensible option. But the heart wants what the heart wants. The buttonholes worked out wonderfully in the end, but ended up being much smaller than planned. The size reduction was due to my scaredy-cat conservative cutting, in trying to handle the fraying and loose threads as best I could. This is the reason why the buttons are so small. I had to find smaller ones than I’d originally planned. Larger, self-covered buttons would have suited the style of this coat better. To keep Miss Seven snuggly warm, I partially underlined the coat with Thinsulate, which reportedly has more warmth for less loft, than wool or even down feathers. Keeping the bulk down in this coat was important because of the close fitting design. The vintage pattern specifically states that the design is “not suitable for chubby girls”. It’s basically just a slim fitting style with no ease around the tummy area. The sleeves are not set in. They are joined to the back as one piece with a separate undersleeve. This design makes for very pretty style lines, but quite a challenging sew. All of this was underlined. 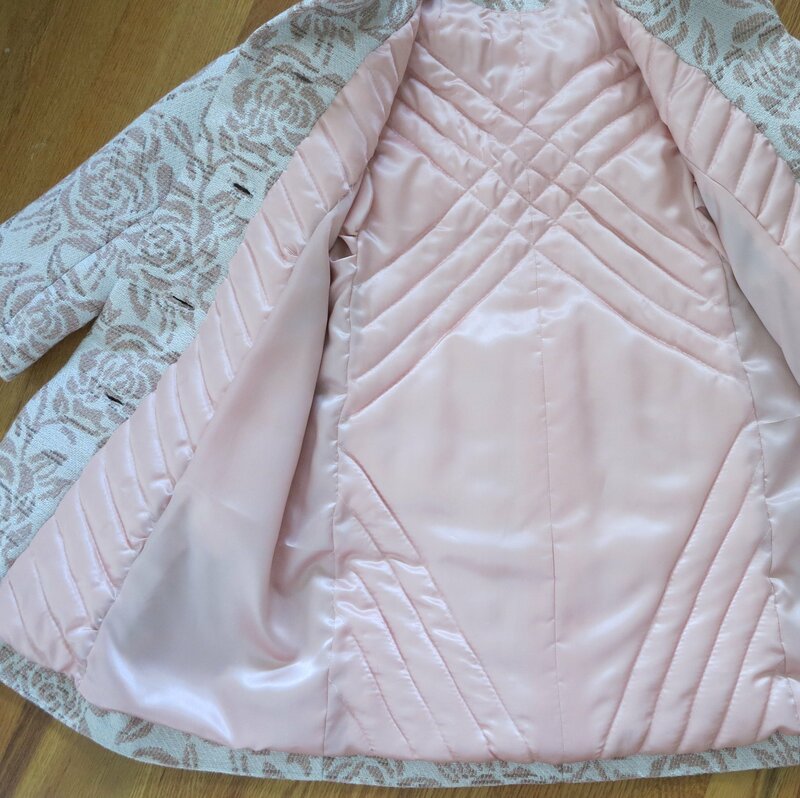 I didn’t underline the undersleeve or the side panels of the coat as I was afraid it might end up making the coat too bulky and adversely affect the end fit. To further reduce the bulk (or loft) of the Thinsulate, I partially quilted it to the lining. I think this makes the inside of the coat look lovely too. The design and fit of this vintage pattern is beautiful. It is a style that fits tall, slender girls very well, which means I will probably use this pattern again in the future. However, it was also quite a challenge to sew (not helped by my difficult choice of fabric) and there are a few things I will improve on when making this coat next time. * My pad stitching of the undercollar was not “aggressive” enough in creating the collar roll. I would like to see the ends roll down a little better. I would also cut the undercollar a little smaller next time. * My buttonholes should be appropriate for the fabric, or maybe I might just take a break from loose weaves. * I was careful about thread marking the buttonholes. A great way to do this is to machine baste two parallel lines down the front and mark the buttonhole positions between those lines. However, with my difficulties in making the bound buttonholes (with all the unravelling of threads), my buttonholes ended up smaller. I also made the mistake of positioning my buttonholes on the inside of the basting thread, rather than on top of it. My buttons look too small and off centre in the coat front. I think I can live with all this though. The coat is adorable. 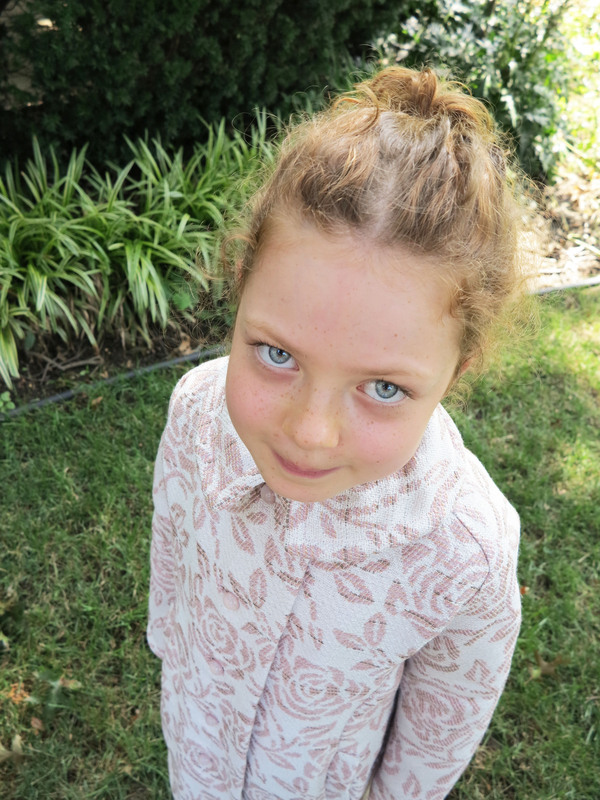 It fits well, but is ever so slightly too big (which is exactly what I was aiming for with my growing girl). I think it is deserving of a trip out to the theatre. 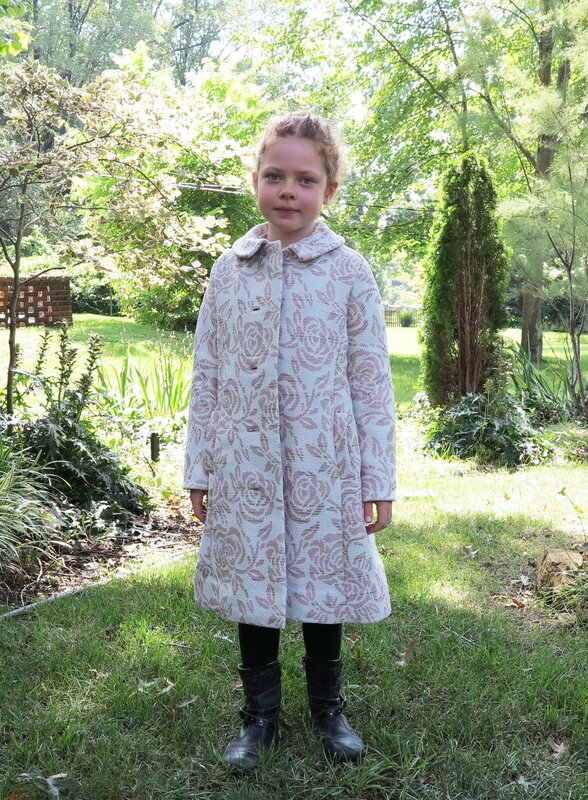 This entry was posted in acetate, coat, fabric, floral, Mood, silk, wool and tagged coat, jacket, lining, Mood, sewing pattern, tailoring, Thinsulate, underlining, vintage, wool on August 7, 2015 by Debbie Iles.